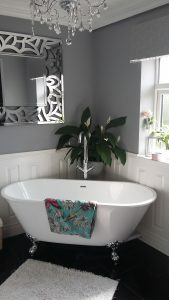 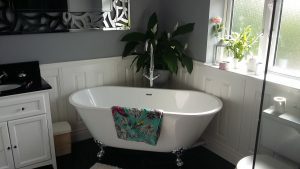 Sandra Callwood made her luxurious bathroom even more elegant with our panelling, though really the bath is the star here with it’s extravagant position in the room. 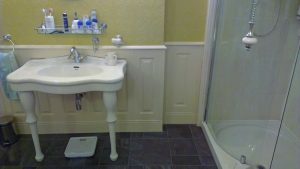 Thanks to Gary Cotier for these images. 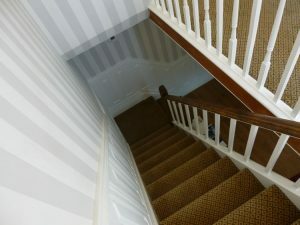 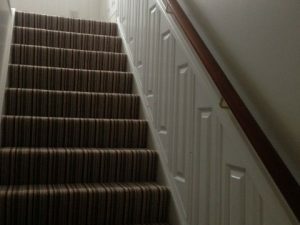 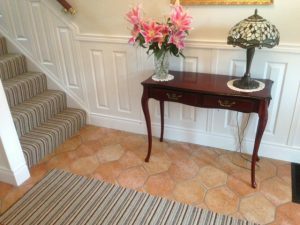 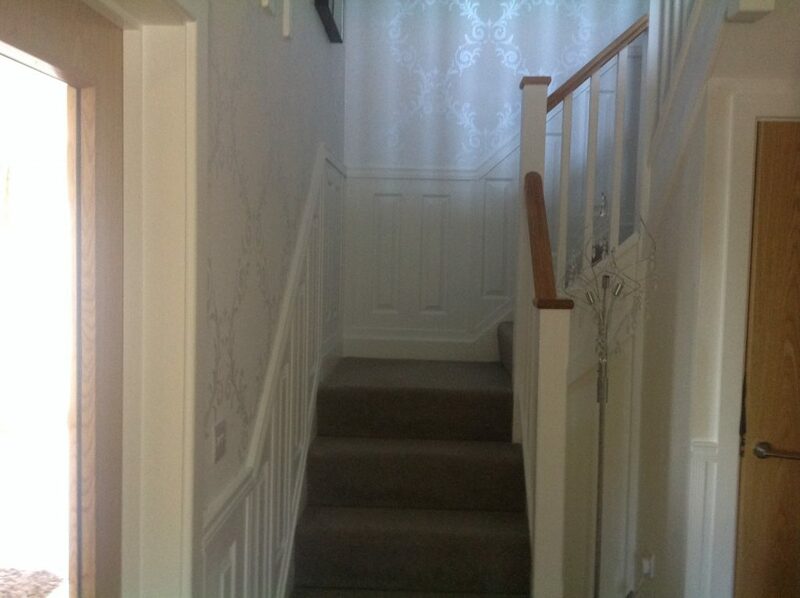 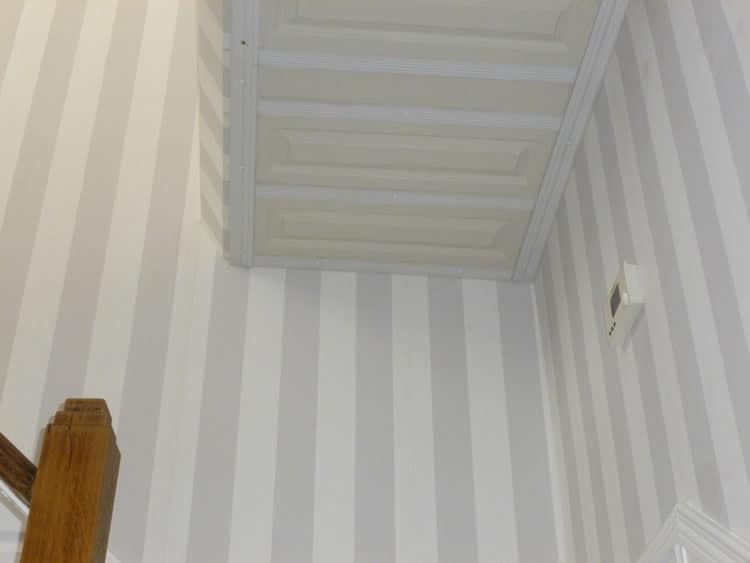 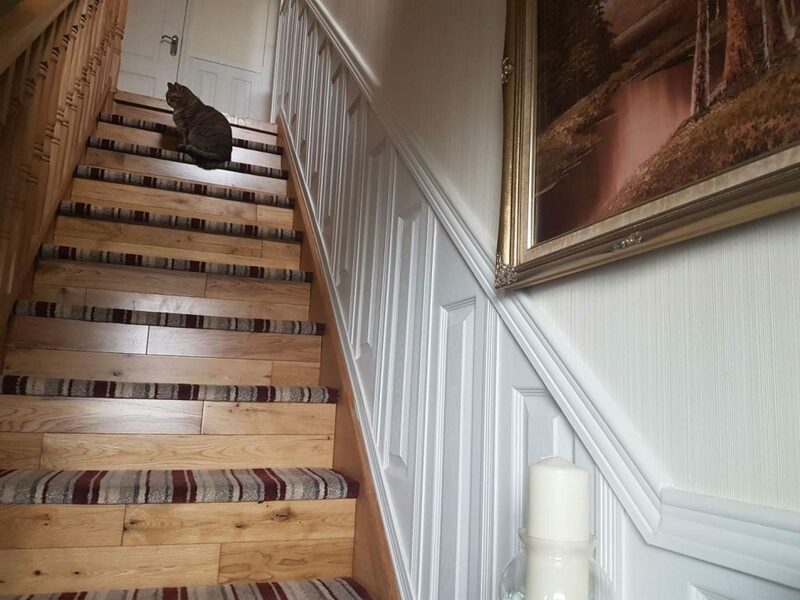 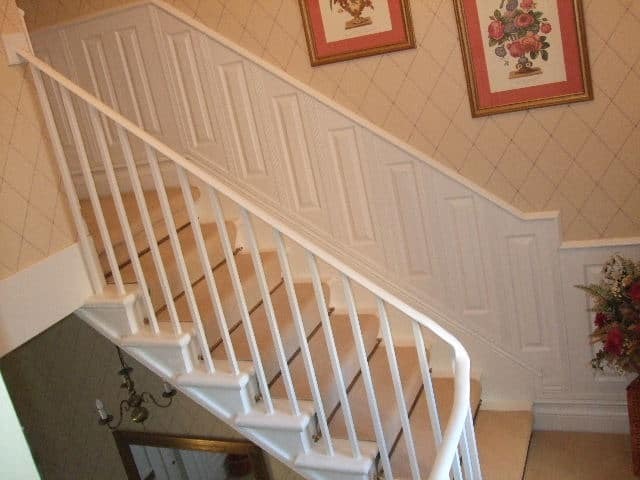 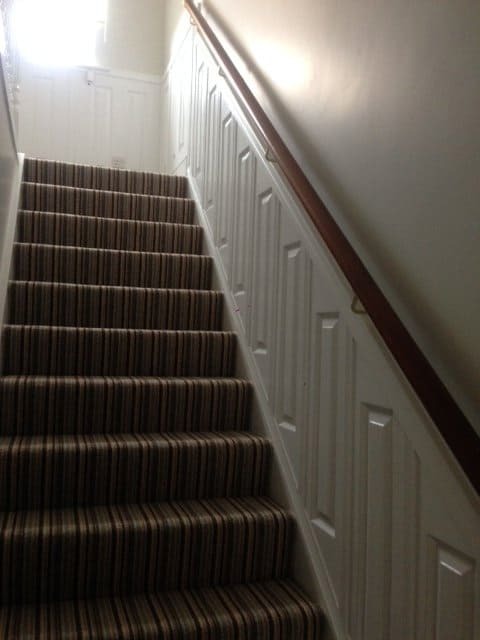 The wallpaper is so effective, see how nice it looks on the first picture – the pattern looks like it was designed especially for his staircase. Keiron Higgins has ordered from us twice and because it’s on our way to relatives in Huddersfield, we’ve delivered personally both times. The latest order is for a grand hallway, but these pictures are of his first fitting in his office. 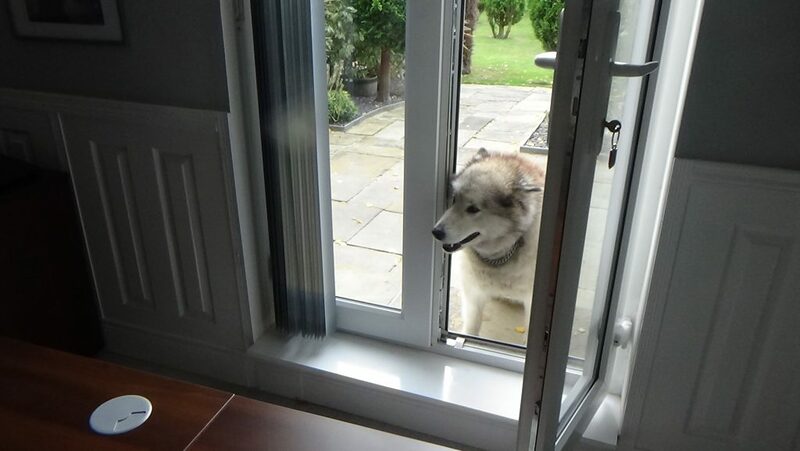 Impressive dog. 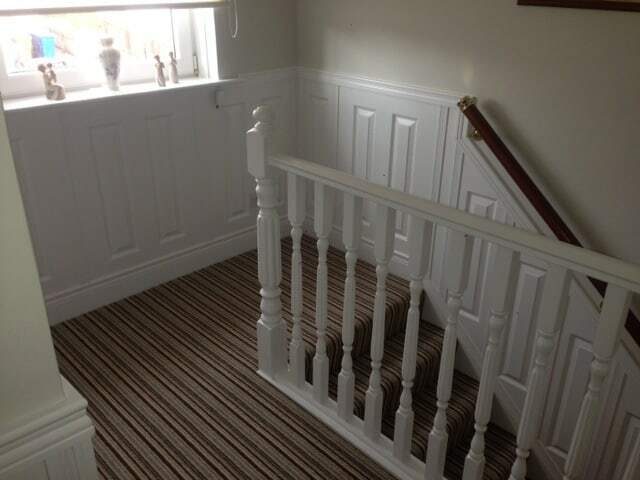 These pictures are from Mr Jackson in Staffordshire. 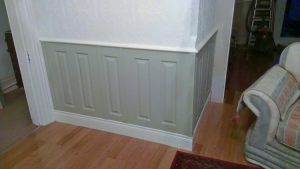 He’s bought from us twice and we delivered the first panels ourselves for a day out – lovely part of the country. 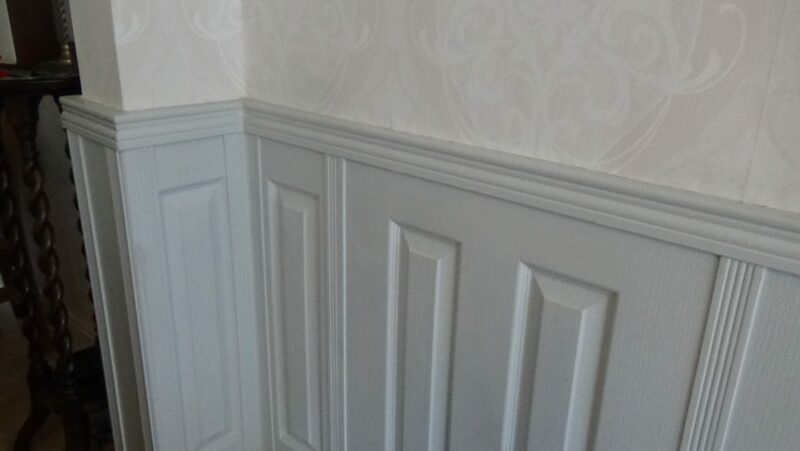 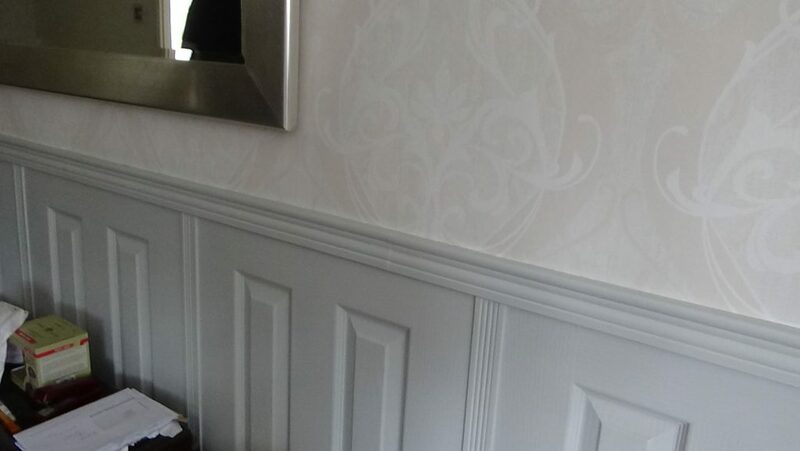 His panelling looks very smart, and the cat’s a star! Thanks to Mr & Mrs Kitson of Houghton-le-Spring. They’ve ordered from us before, but this time we delivered the panels personally. A while later, we received these photos – you can tell he’s a professional can’t you? 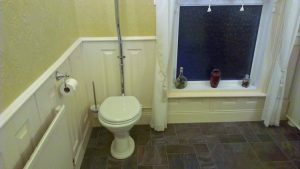 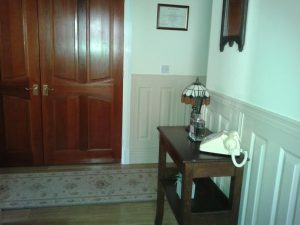 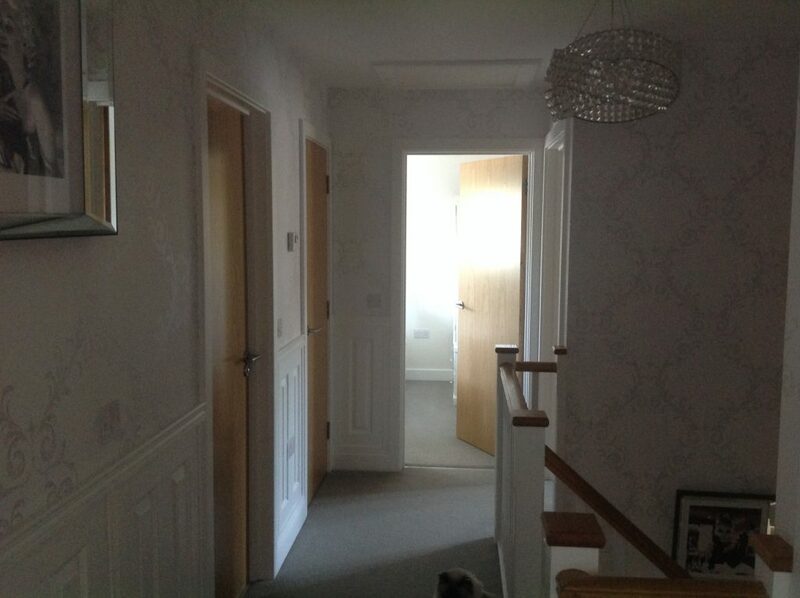 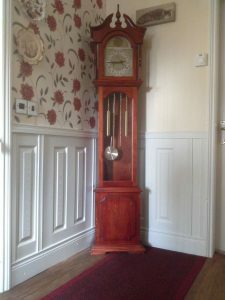 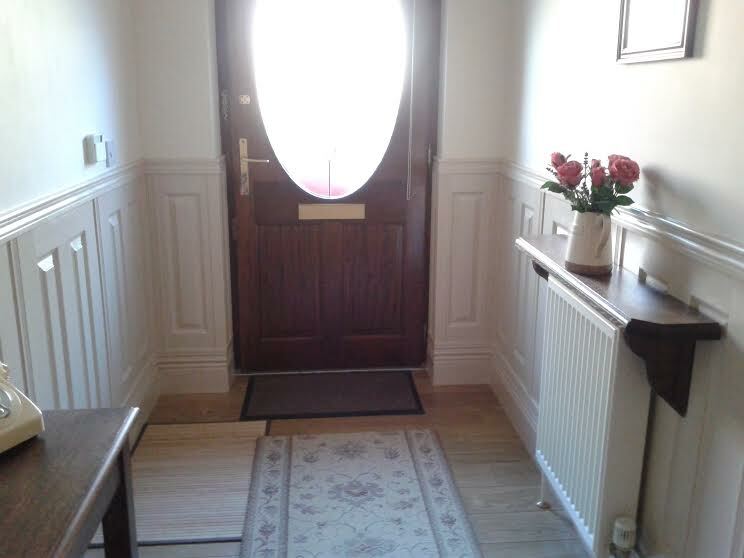 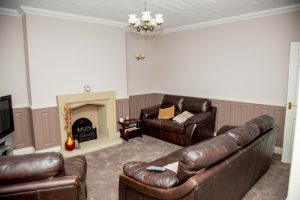 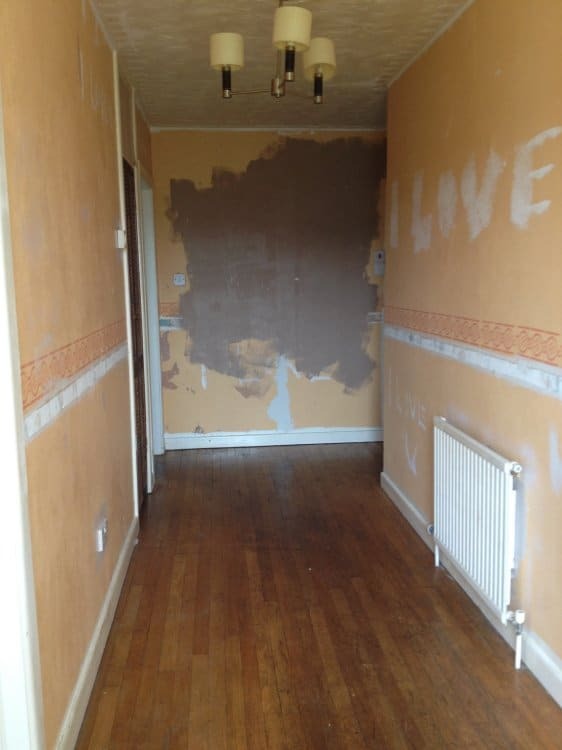 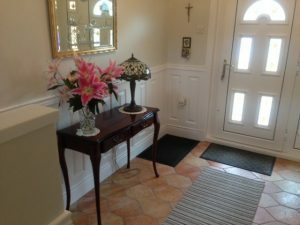 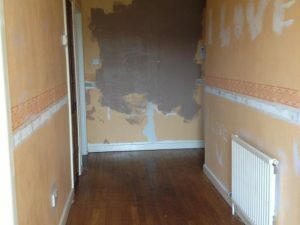 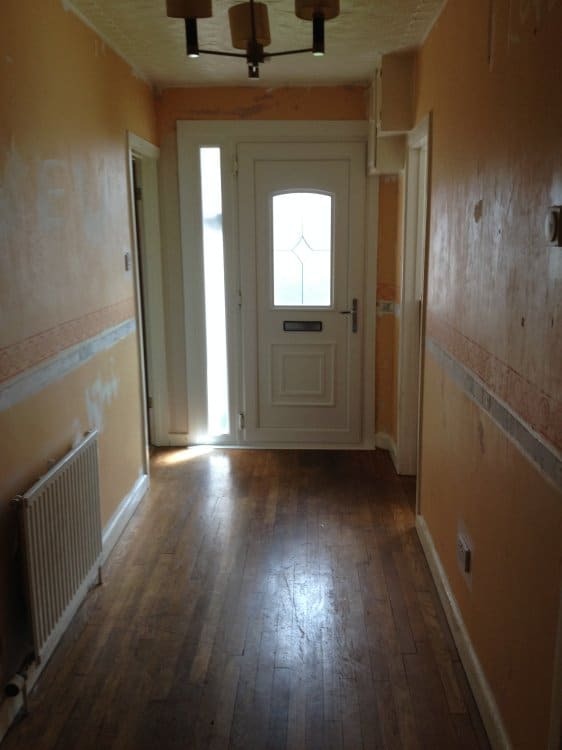 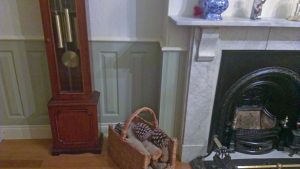 “These are some of the photographs of my mums hall …. 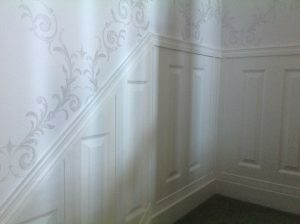 and as you can see the finished product is stunning thanks to the panels. 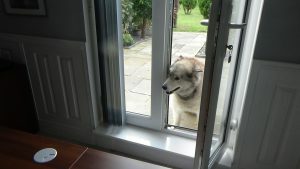 She is over the moon”. 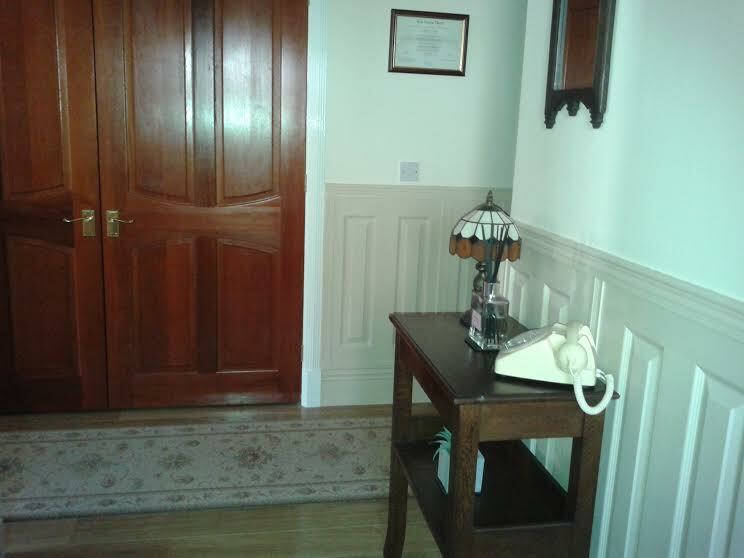 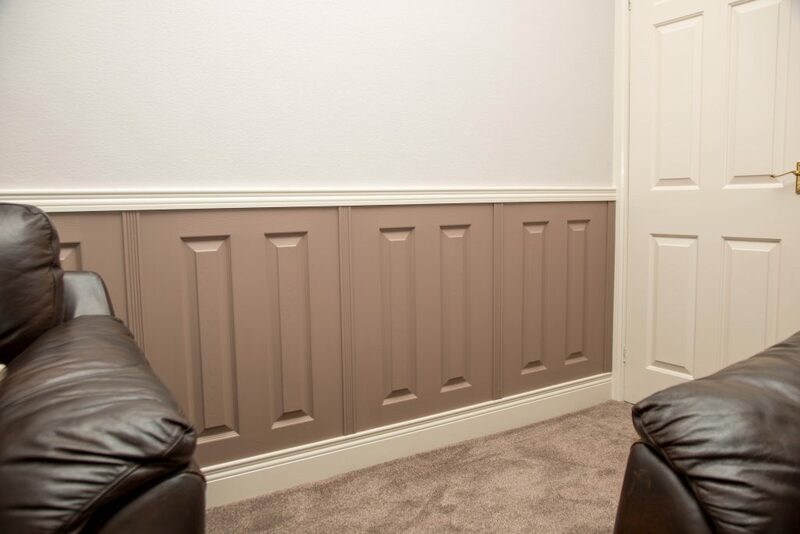 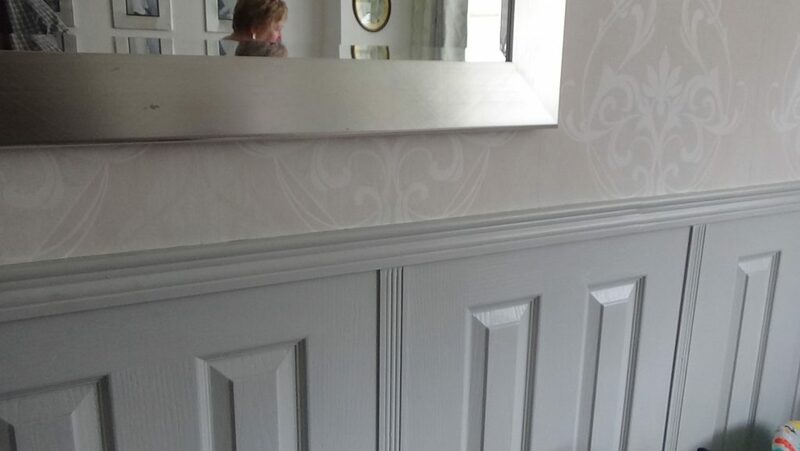 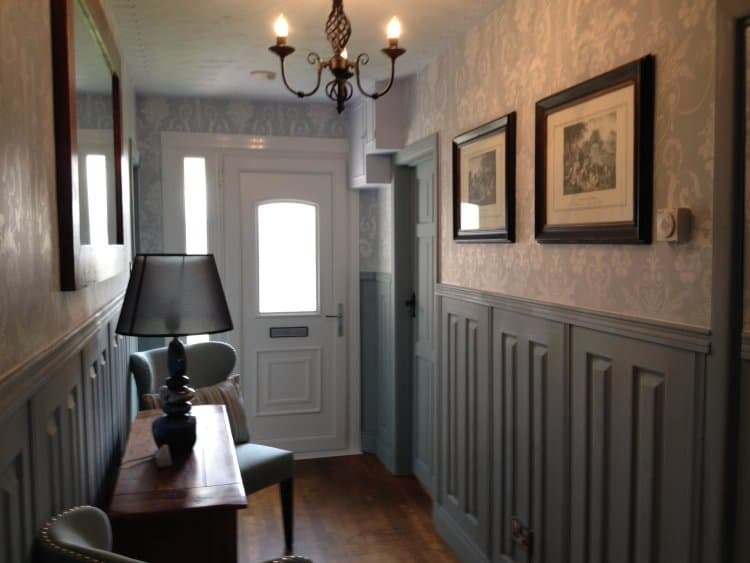 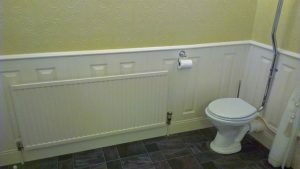 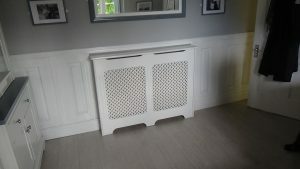 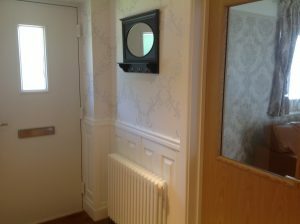 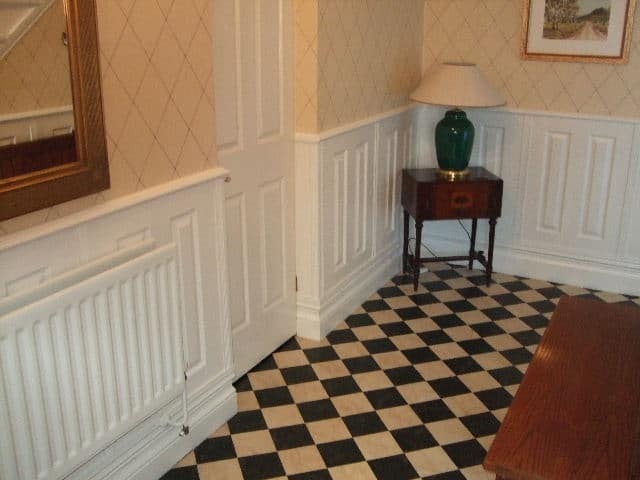 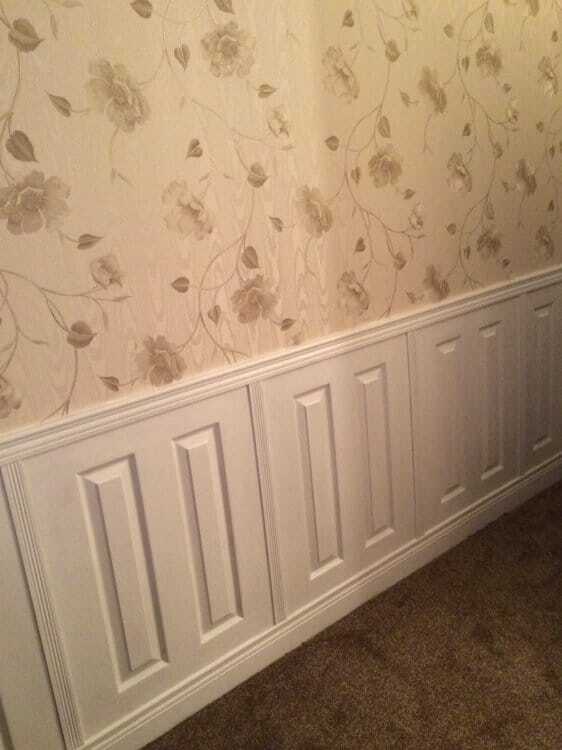 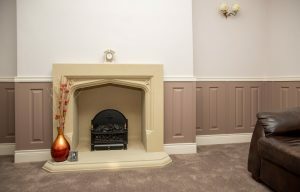 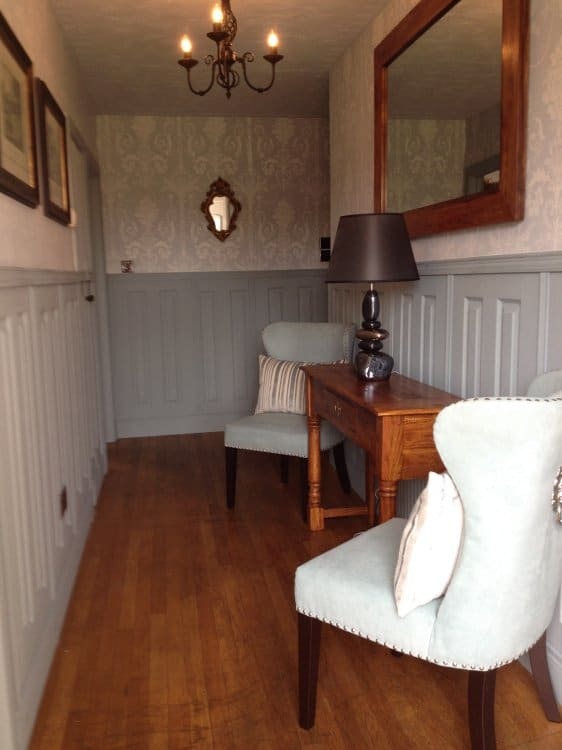 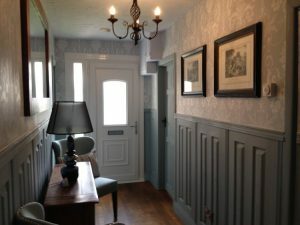 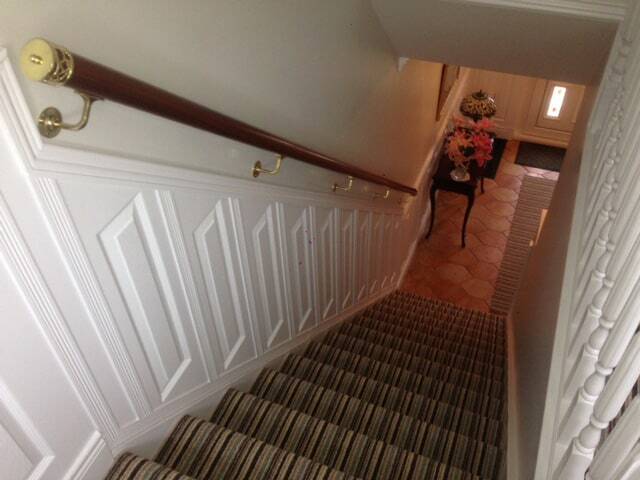 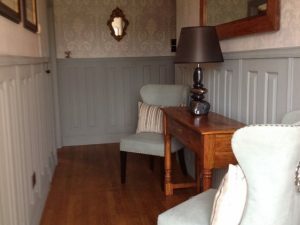 Thanks Mr Craven, we really appreciate feedback, and doesn’t the panelling look fabulous? 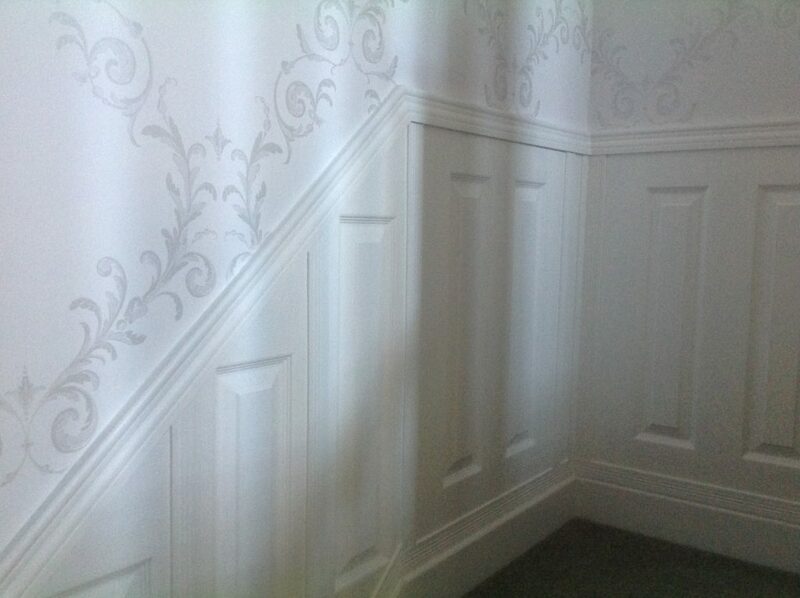 Thanks to Mr Giblin of Widnes for this wonderful set of photos of his Hare Wall Panelling project in July 2014. 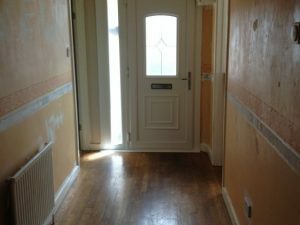 Before and After images. 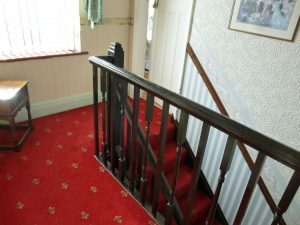 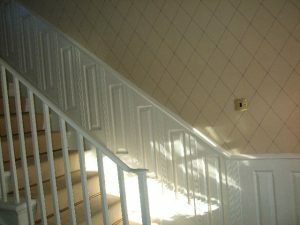 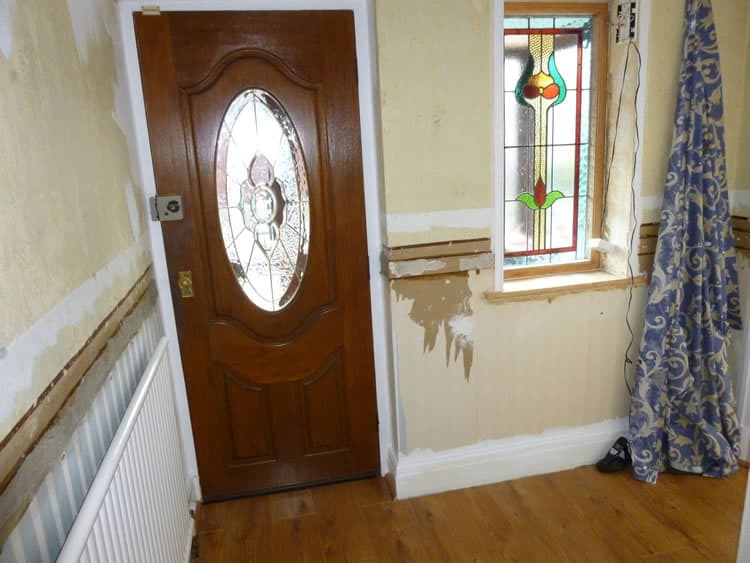 The left hand photo is just after starting work, with the old dado rail removed. 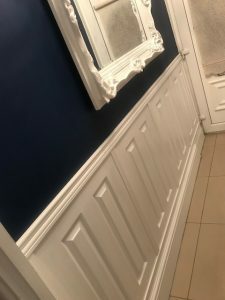 Right hand photo is finished. The new look is light and stylish. 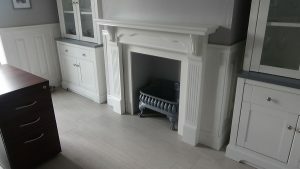 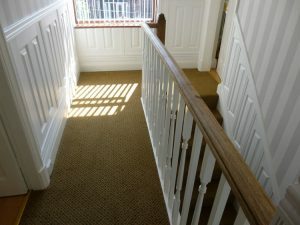 Another before and after pair, this time in the hall downstairs. The new photo is almost finished – just the radiator to put back at the left hand side. 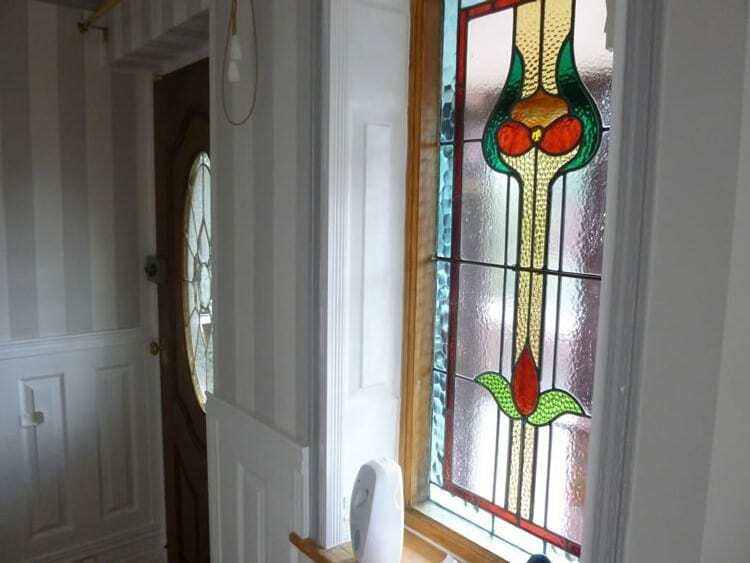 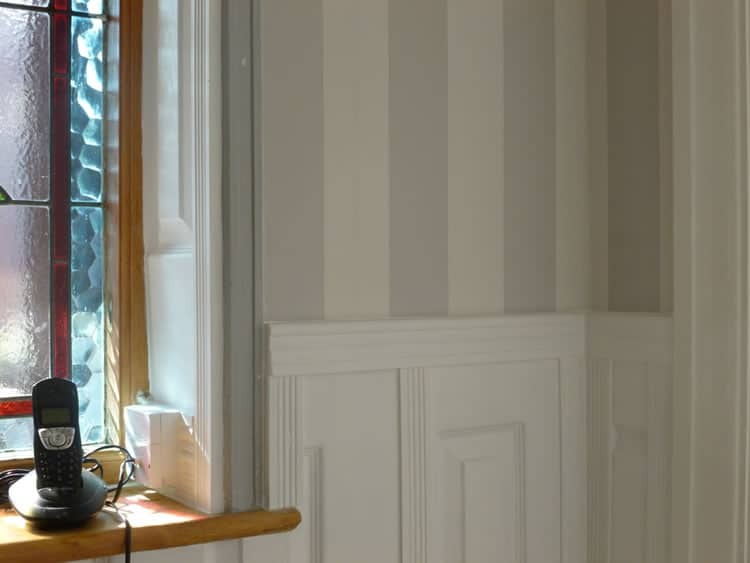 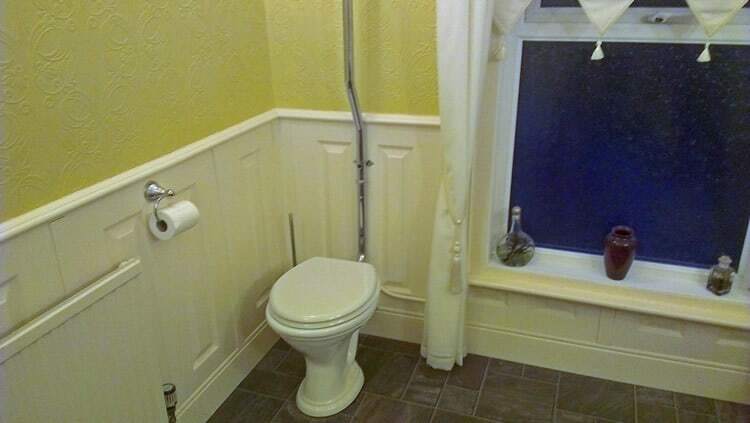 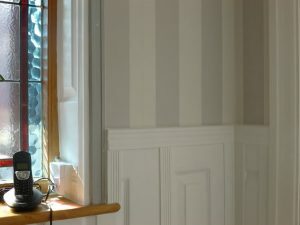 Above: The attention to detail is very impressive – see how he’s taken the panelling into the window reveal. 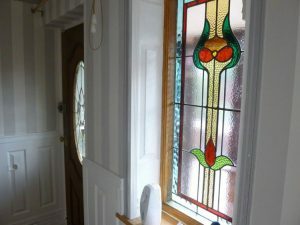 Another image in lower hall, showing detail to window reveal. 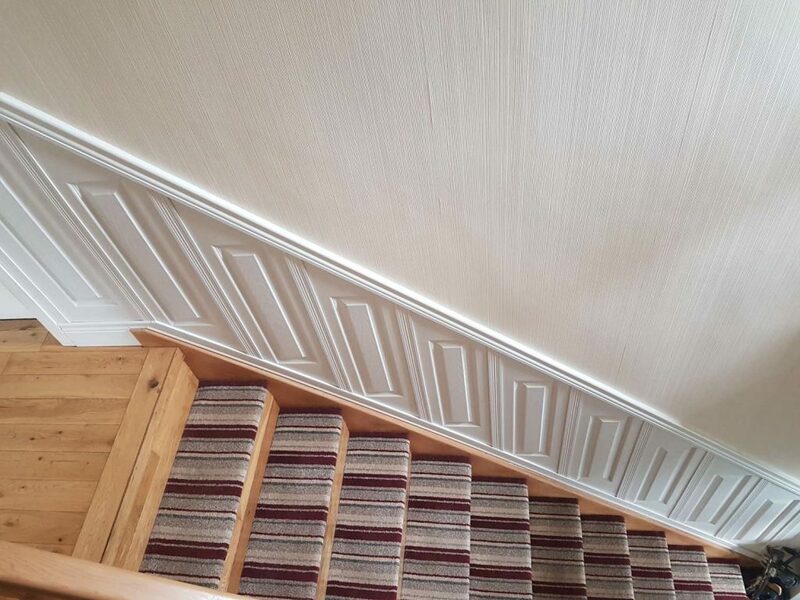 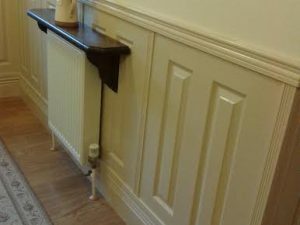 He’s used existing skirting with a joint strip and dado on top to allow the panelling to cover the rough edges of the old top dado. 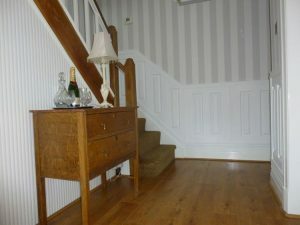 The lower hall. 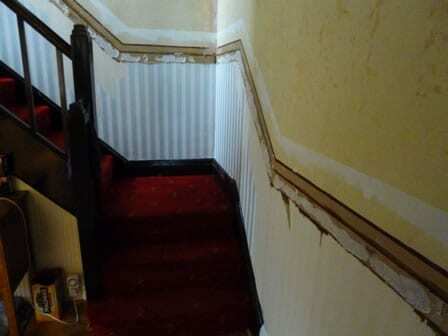 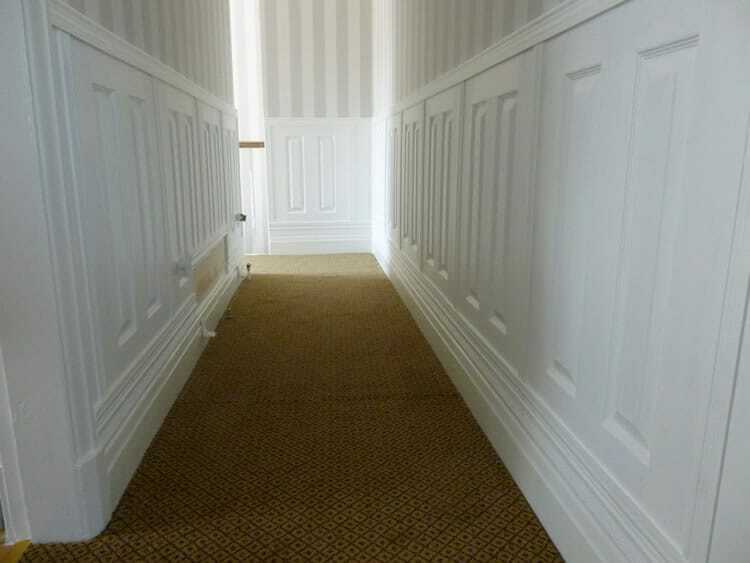 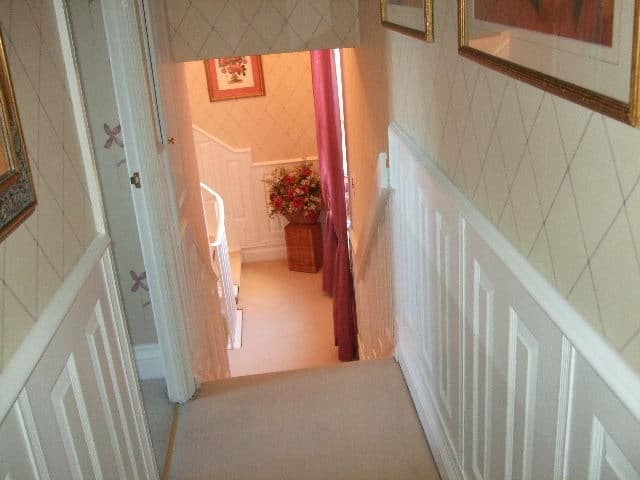 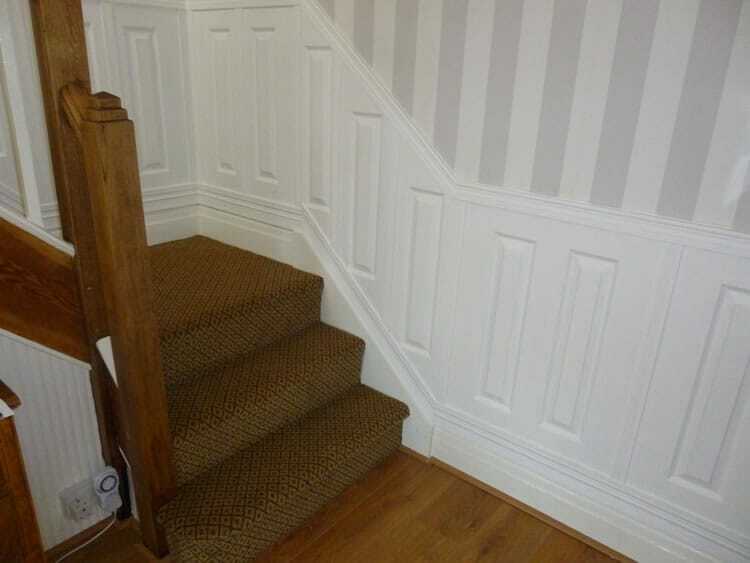 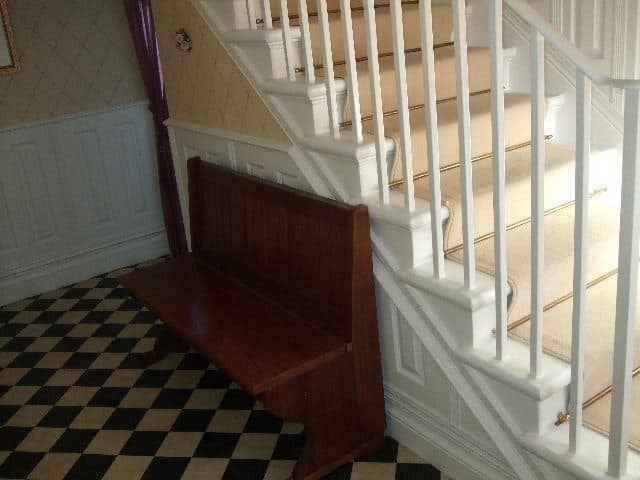 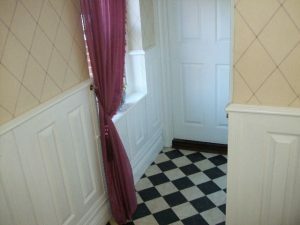 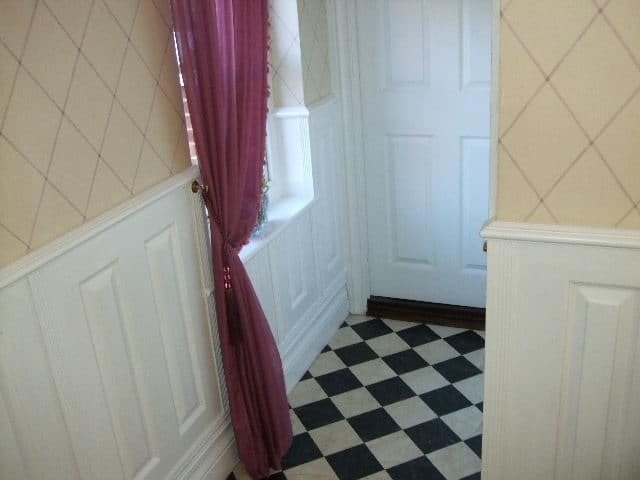 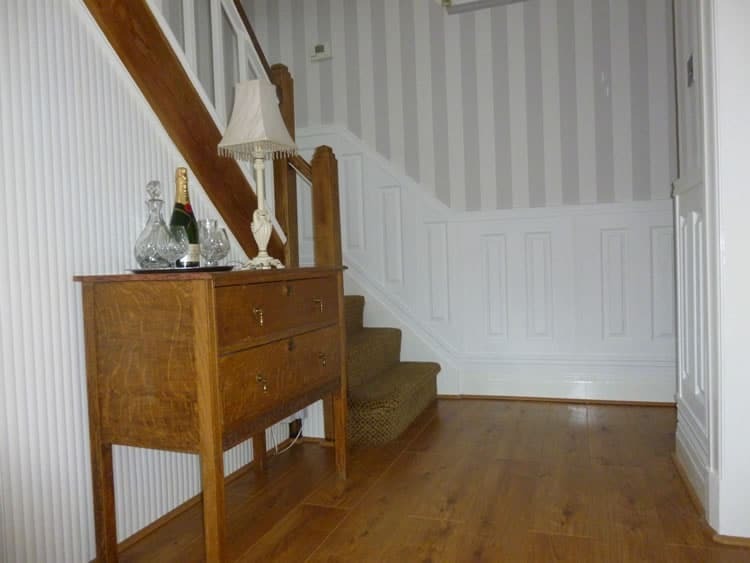 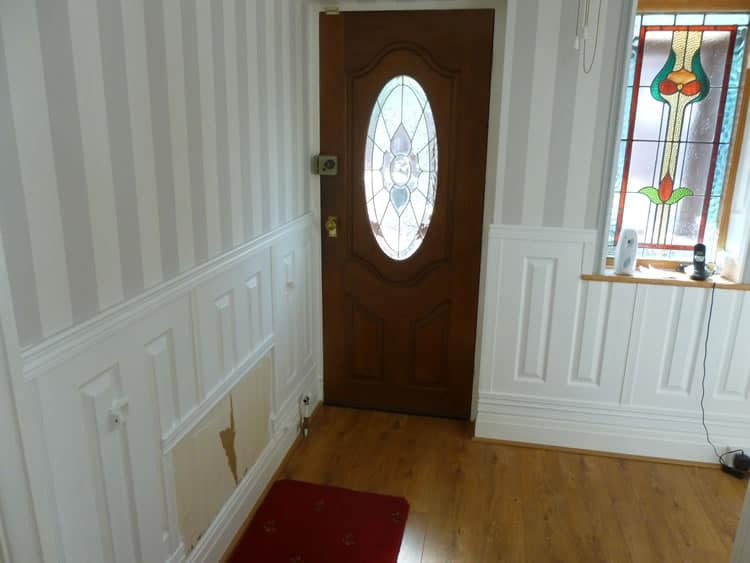 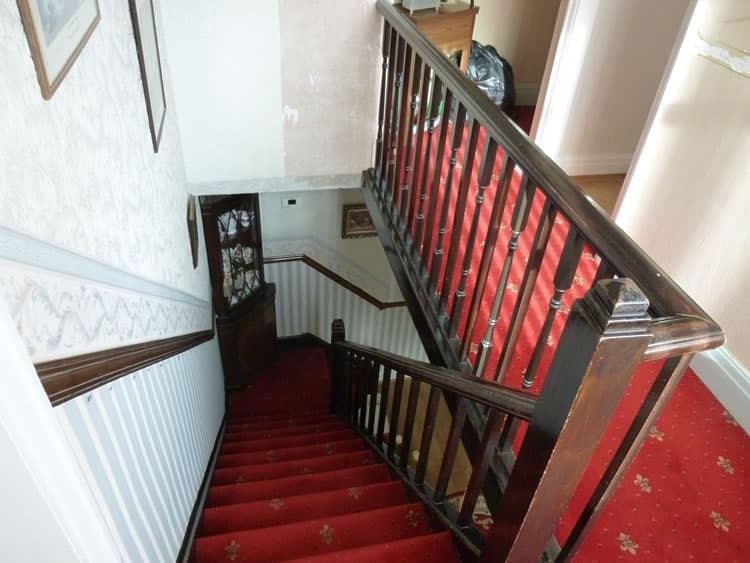 We’re really glad that Mr Giblin decided to keep the period striped panelling under the stairs. 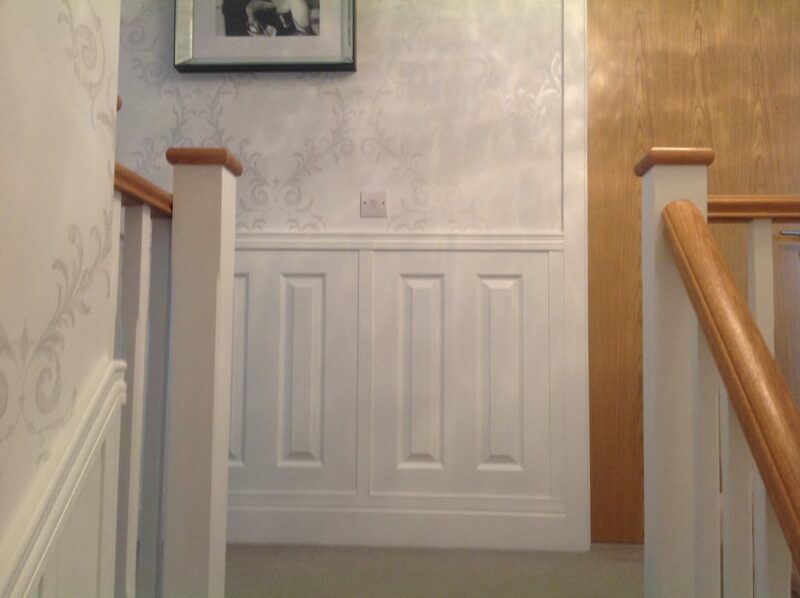 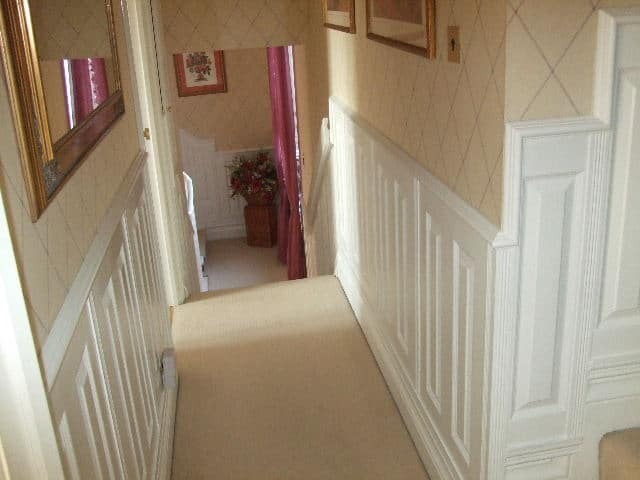 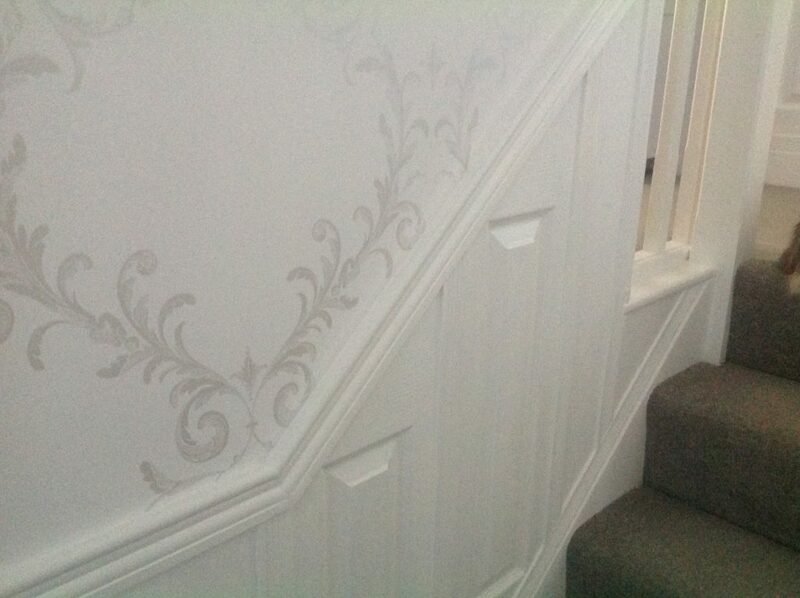 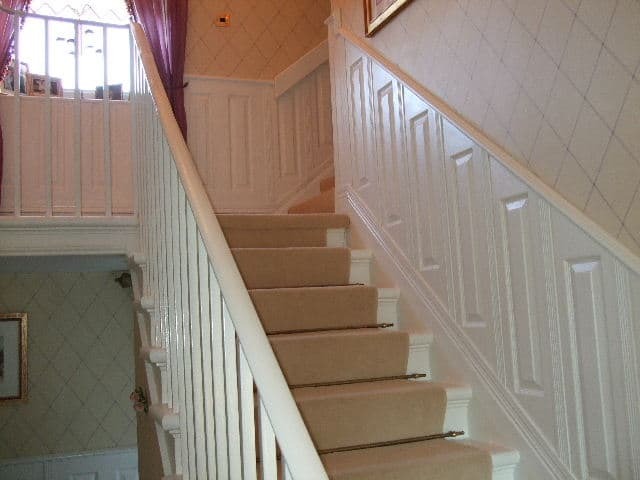 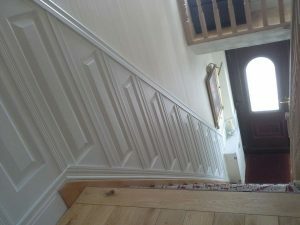 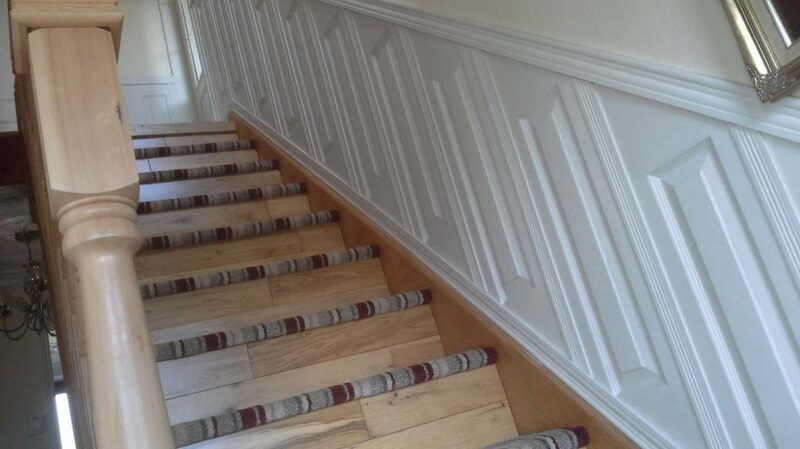 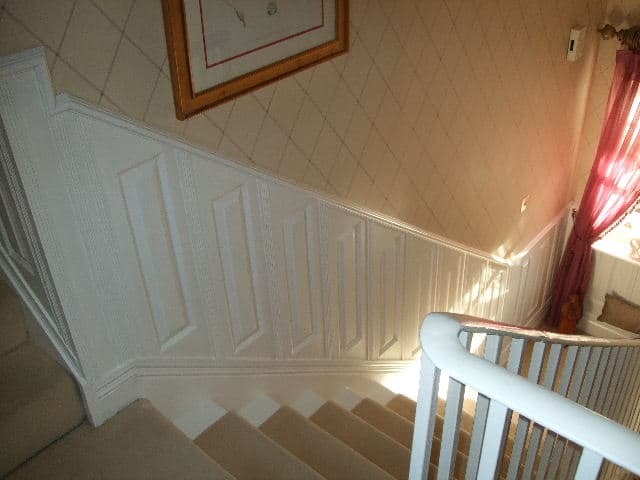 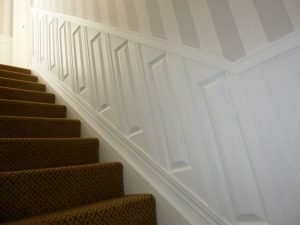 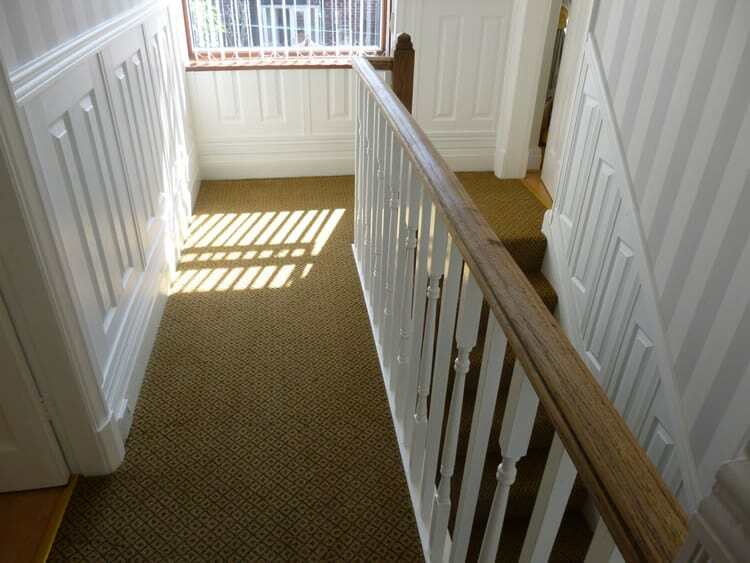 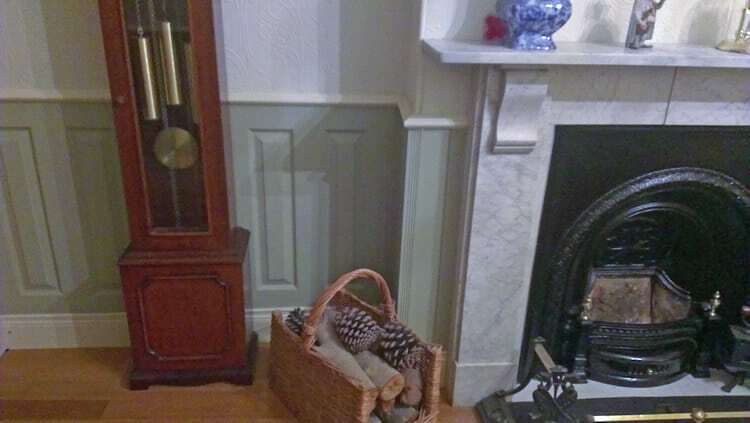 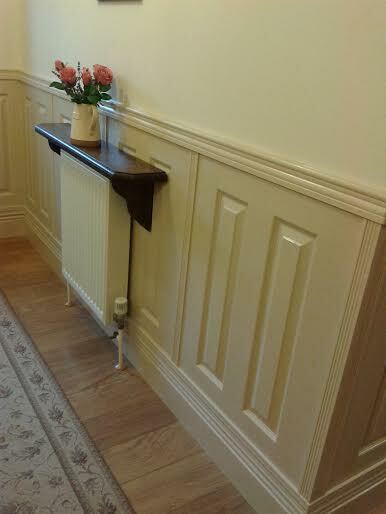 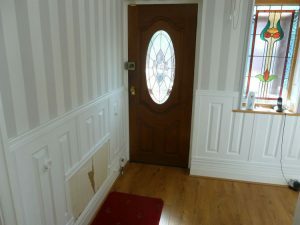 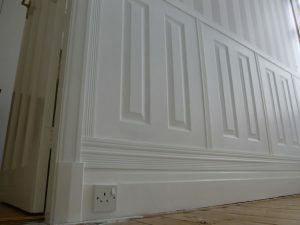 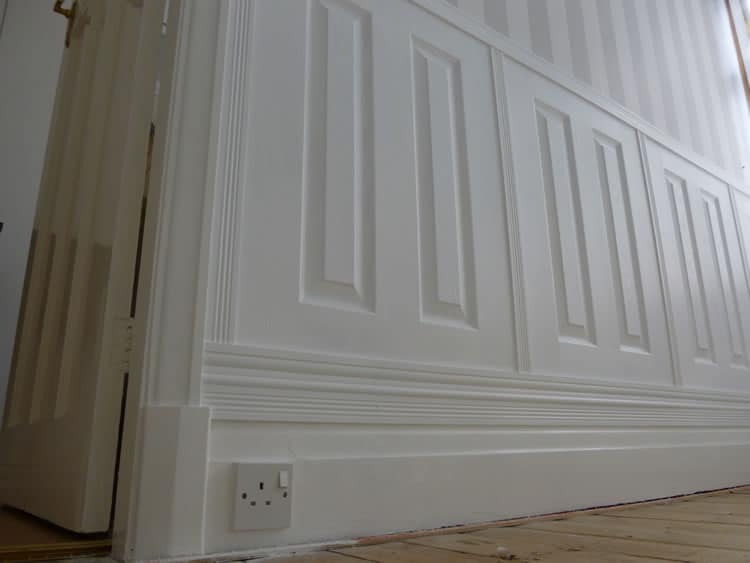 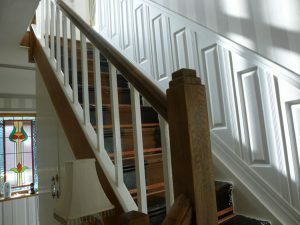 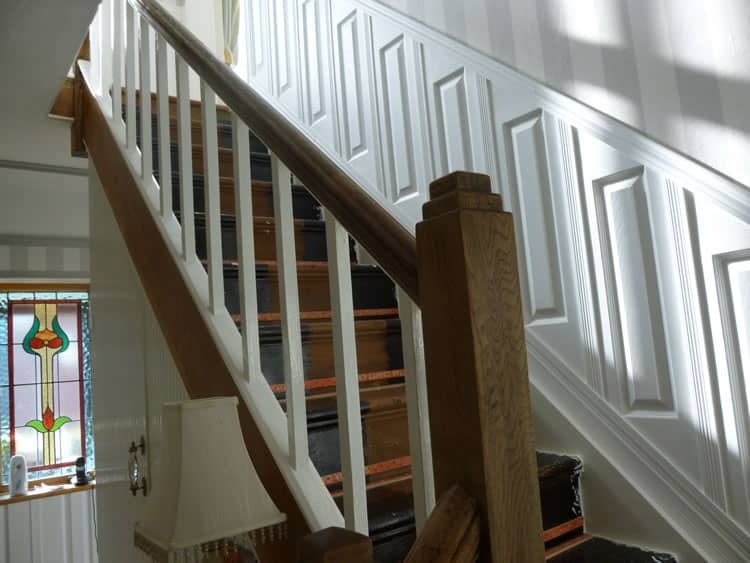 More attention to detail – a little bit of lower ceiling on the landing panelled, ready to paint. Thanks to James Allen from North Somerset for these pictures. 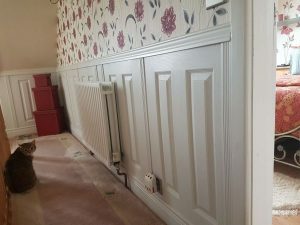 James bought the last of our long wall panels and these before and after shots show what a difference our panelling makes. Thanks to Mr W Ellis from Devon for supplying us with these photos – an example of how elegant the panels look when fitted. 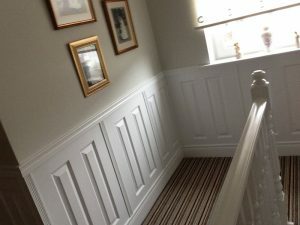 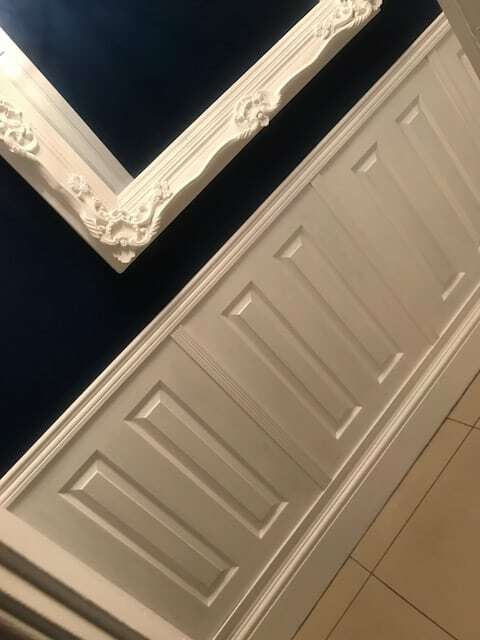 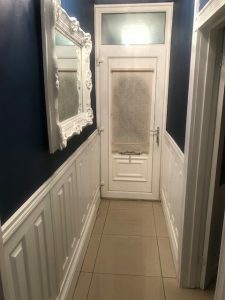 Note that the dado rail shown on these photos has changed to the current one you can see on our order page, and in the newer pictures further up this page. 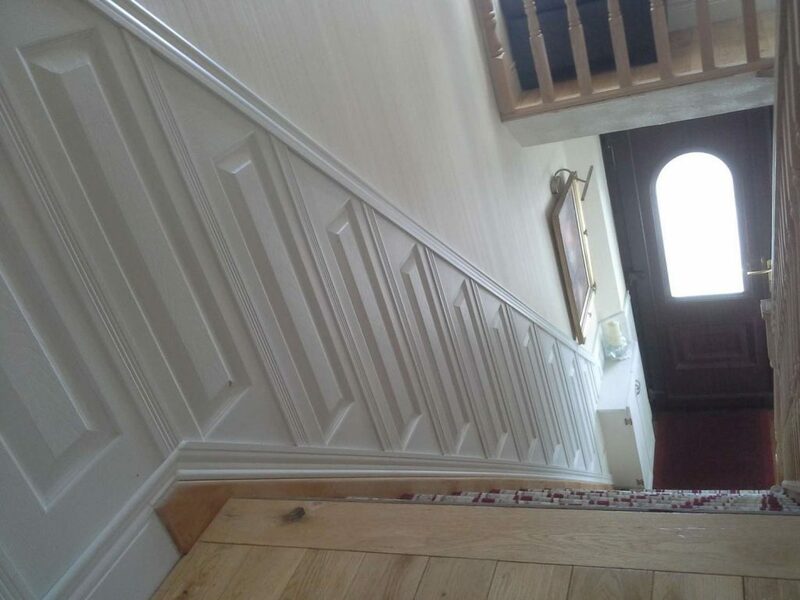 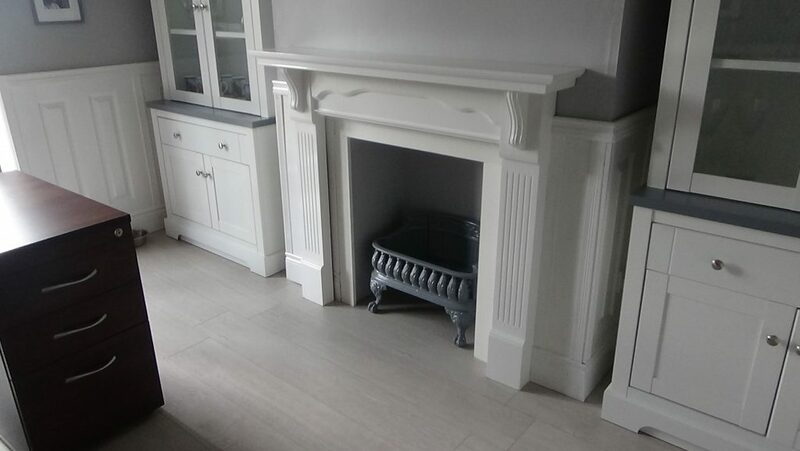 Check how this customer has tackled the tricky bits. 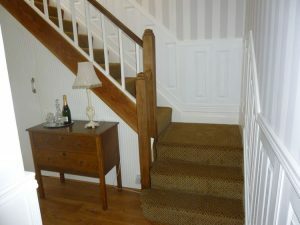 Note that we got these pictures from the previous owner of Hare Wood Products, we don’t know who the customer is. If you know, please could you tell us so that we can credit the photos?